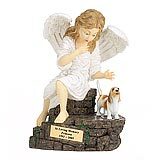 "I received my Angel Ashes urn today. I was very pleased with it. It is very beautiful and I thank you for providing such a beautiful product." 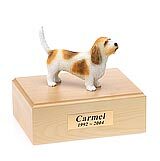 All available Basset Griffon Vandeen dog urns and memorials will be displayed with the figurine on the Basset Griffon Vandeen urn you select and in the appropriate size.